Today I have for you a recipe that I have been wanting to make, it was on my Fall list of foods to make this season. Let me introduce to you Pumpkin Bread with Chocolate Chips! Yum!!! I guess you can tell I have been having fun with the themes and funky text that I have been adding to my pictures. I think I may have just a tad bit too much time on my hands! As you can tell from the picture I finally broke down and made some pumpkin bread! I have tried 3 times to make pumpkin muffins and they just weren’t blog worthy, but bread, bread I’m good at! Ohhhh, how I love bread!! 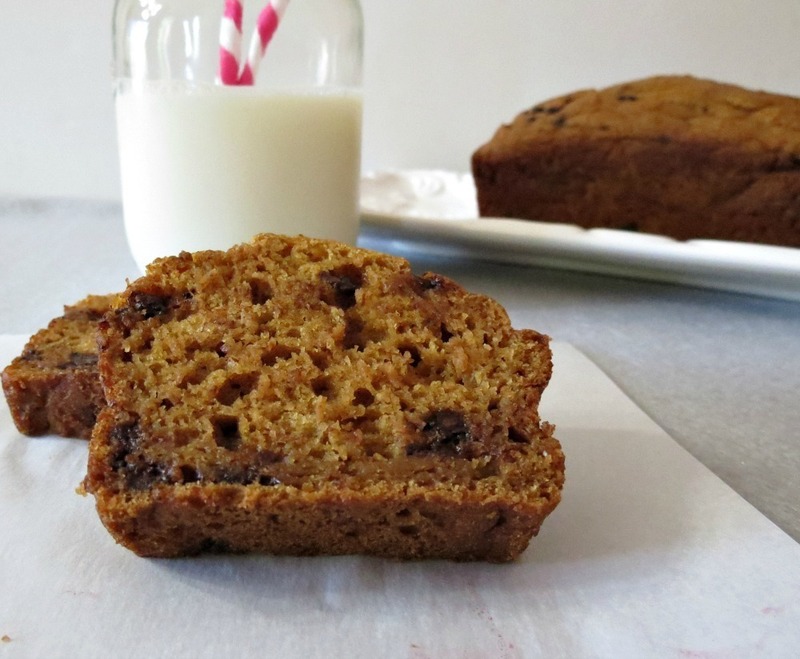 This pumpkin bread is moist and chock full of mini chocolate chips to give it some extra sweetness. Whenever I use chocolate chips in any of my recipes, I tend to cut back on the sugar. In this recipe, I only used 1/2 cup of sugar. I know most recipes use a cup or more of sugar, so please if you’d like a more sweeter bread, then I recommend adding more sugar. But personally I think the bread is sweet enough, especially with the addition of the chocolate chips. I think my less sugar is working on my Husband. I made him Snicker Cookies, which is fun size Snicker candy bars cut up into pieces and folded into a chocolate chip cookie base. I only added 1/4 cup granulated sugar and 1/4 cup brown sugar and he told me the sugar amount was perfect, otherwise he thought the cookies would have been too sweet! I almost fell over. You know if you just gradually cut back little by little on the sugar, you won’t even miss it! Trust me, I know! I have the biggest sweet tooth!! Oh and your probably wondering, Snicker Cookies! Yes, I made them! I always make my Husband some kind of cookie every week and he wanted Snickers in his cookies! I will tell you they were good! I snuck a cookie or two! I am sure he will be wanting me to make them again! This recipe is pretty easy to make and I didn’t add any oil to it! I used greek yogurt and applesauce to make it moist! Believe me, you won’t miss the oil at all!! Also, I decided on using egg whites instead of whole eggs. I wanted bread that was guilt-free, low in calories, low in fat and super tasty! This bread exceeded my expectations!! I couldn’t be more pleased with it!! This recipe will make one large loaf or three mini loaves. I made minis, as you know I freeze them. My Husband eats a whole loaf for breakfast and I like to take one into work to share. But it’s nice, because I have three loaves this time around, so I think we will keep one at home to just simply enjoy with a cup of coffee! 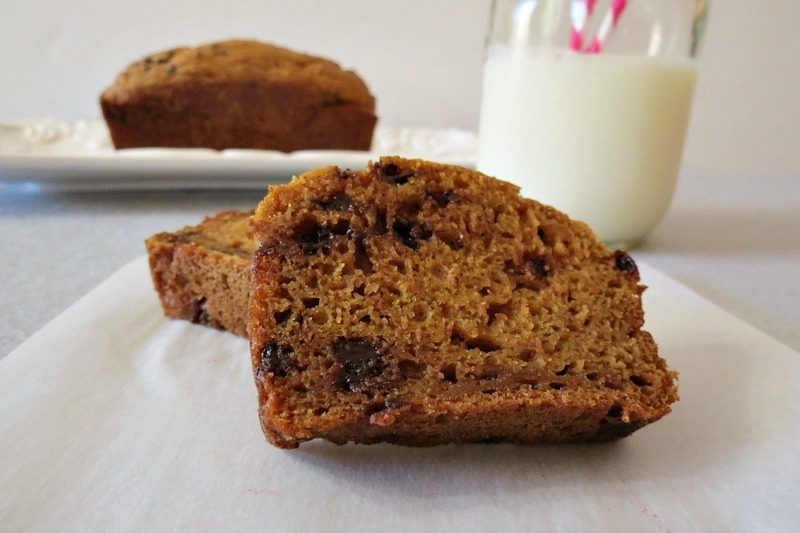 A healthy, sweet, moist quick bread made with pumpkin and little chocolate chips. In a bowl, add egg whites and sugar, whisk together until incorporated. Add pumpkin, applesauce and yogurt. Whisk until combined. Add cinnamon, ground nutmeg and pumpkin spice; mix well. Make a well in the center of the flour mixture and slowly add the pumpkin mixture and fold together until combined. Do not over mix. Update: I just found out I was nominated for the top 25 food blogs by Skinny Scoop! I am so excited and so honored!!! I am up there with so many wonderful blogs! If you check the list out, I’m on the lower part of the list. If you like me, just click like! No signing up required!!! You can just go here or click on the Skinny Scoop photo! Thank you everyone for making this happen for me! With out you, I wouldn’t be here!! You can tell by the photos how moist this bread it. It looks wonderful! One of my favorite pumpkin breads! Love that you subbed out the oil–there’s always so much of it in these quick breads. Congrats on your nomination! 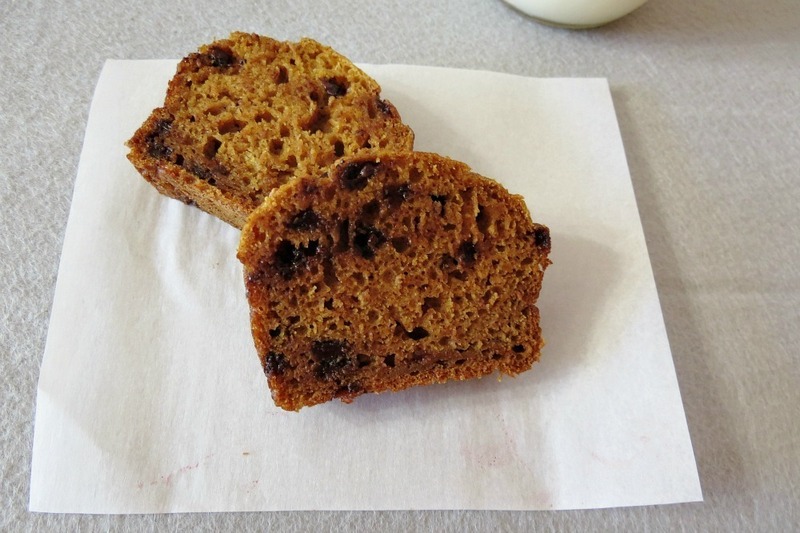 MMM great recipe, I would have never thought to try pumpkin bread with chocolate chips that sounds heavenly. And I love that you used whole wheat flour! Nice 🙂 Have a wonderful weekend! 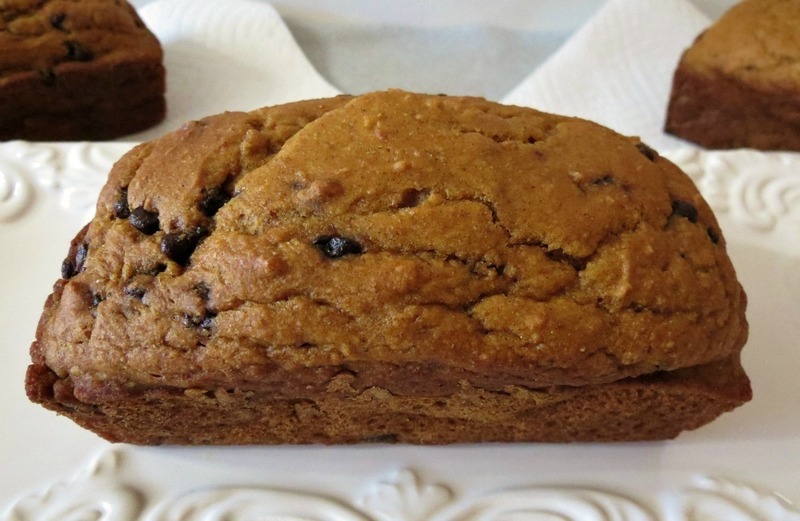 There is nothing like a moist pumpkin bread…and then when you add in chocolate chips? Well, it sounds just heavenly. Thank you for sharing! 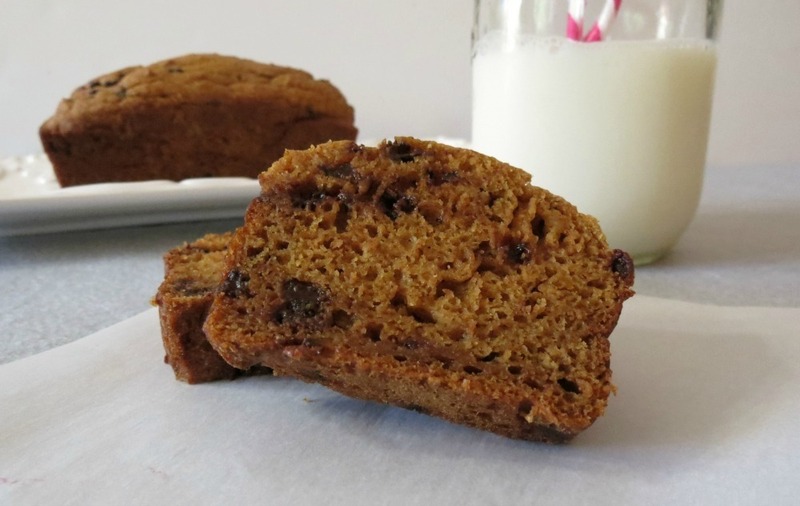 Whole wheat, low sugar, egg whites, greek yogurt…you have healthified pumpkin bread but it still looks incredibly moist, my #1 thing with bread. Cannot be dry and yours looks awesome. Congrats on making the top 25!